In January, as part of DC's Blackest Night event, 8 classic titles rise from the grave for one more issue. 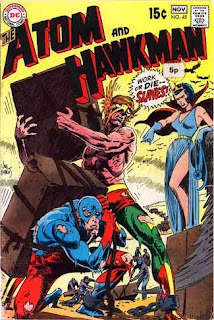 However over a dozen books can be a bit of a hard ask for any New Years comic budget, so to help you decide which to grab, here's the wrap on the latest in our 1-0-1 series; The Atom & Hawkman #46. WHY YOU SHOULD CARE: An archaeologist and a physicist may not be the most likely of friends, but Hawkman (Carter Hall) and The Atom (Ray Palmer) have had each others backs for years. Infact it was in seeking out Carters advice on coping with his recent tragedies, that Ray was ambushed by the 'Black Lantern' Ralph and Sue Dibny, and their latest victims; Hawkman and Hawkgirl! In The Atom & Hawkman #46, hunted by bodies of his ex-wife and closest friends, will the self-shrinking hero be able to put aside his grief and rise to the need for a hero - especially when the zombiefied alternate Hawk couple; Khufu and Chay-Ara burst onto the scene! With art by Ryan Sook of Wednesday Comics - Kamandi fame, and written by DC's mega-scribe Geoff Johns, it's going to be a page-turner finding out! For fansites of The Atom and Hawkman, turn to the tinytitan or beingcarterhall blogs.